Wooden Pallet information (*) More details ? Please download our Technical Specification. 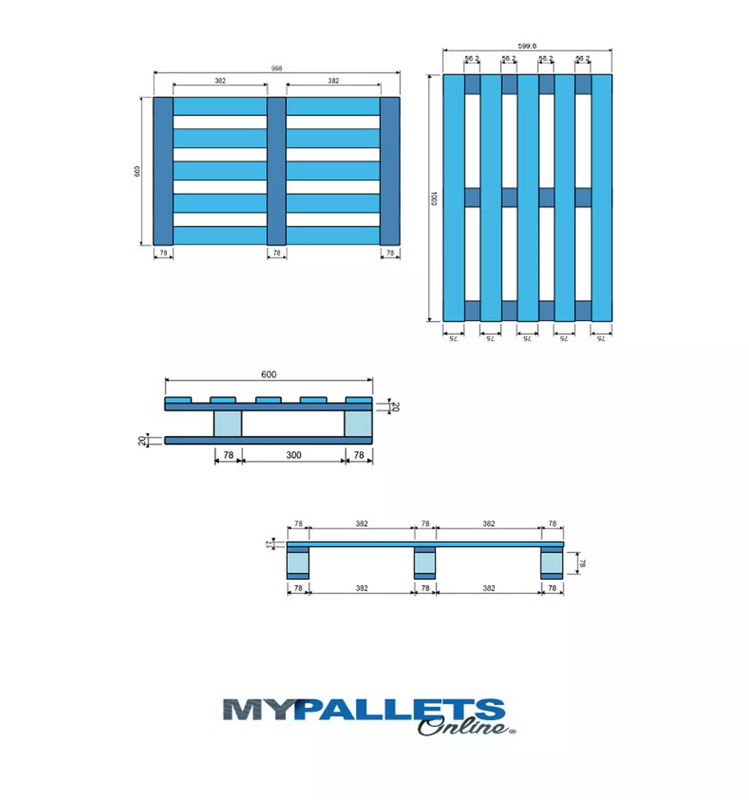 - the number of pallets constituting the stack can also be adapted to your own needs, especially if you have height constraints for the passage on the platform or under your doors. The maximum is one delivery per tray with 40 high pallets per stack. On your request, we can offer you a delivery in a trailer truck with a larger quantity. The dimensional family of perimeter is 600 X 1000 is a 1/2 pallet. As from the validation of your order, the delivery time normally noted of your order is 1 to 2 weeks for quantities lower than 100. For large quantities (full truckloads for example), we specifically manufacture your order in 60X100 semi Heavy duty Wooden Pallet. We can also customize and add on your pallets your Logo, or any inscription desired in fire marking on wooden blocks. The delivery time is then generally between 3 and 4 weeks. We select our transport partners for you to guarantee both the reliability and quality of your delivery. We are also in direct contact with our carriers to always know where your order is. We can deliver anywhere in Metropolitan France, Corsica and Europe. That is why we systematically carry out an "estimate" study that we submit to you. External dimensions are 1000 mm long, 600 mm wide and 135 mm high. It is a pallet with 4 entries, i.e. you can handle your pallet with a forklift truck or a pallet truck by the 4 sides. 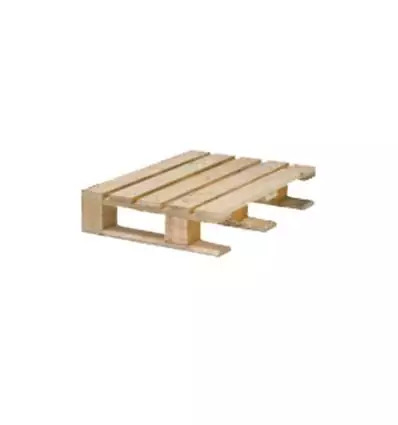 Wooden Pallet 600X1000 Half Heavy duty weighs less than 15 Kgs, it resists a dynamic load of 750 kg and in static of 1000 kg. The skirting boards, i.e. the space between the boards of the tray is approximately 56.25 mm. The total theoretical wooden volume of the pallet is 14.838m3. You can find all the details of the characteristics by downloading our specifications under the tab "Technical Data Sheet". 4 way entry pallet in wood is subject to the ISPM15 standard for the heat treatment of wood packaging. The relative humidity of the wood pallet is above 45%. For this reason, we strongly advise you to mechanically dry your pallets for your container or long-distance truck exports. This will avoid the potential inconvenience of contamination by mould or fungus as well as the rising of humidity on your boxes during deliveries. For your exports, we provide you a certificate of conformity of the pallets that we will have been treated in accordance with the standard ISPM15. It does not require any special storage conditions. You can store indoors or outdoors. When loaded with your products, they can be stored sheltered or outdoors depending entirely on the protection and weather sensitivity of your products. New pallets are handled with an electric or manual forklift truck or pallet truck. The precautions for use are only associated with your handling conditions and the condition of the soil during transport. If you hit a pallet with the forks of a forklift truck, the forks can seriously damage the structure and alter the load resistance conditions. When handling by hand, the use of suitable safety gloves is mandatory to prevent splinters and cuts. They are produced according to strict quality criteria using sections of softwood (pine, fir, Douglas fir, etc.). The variability in moisture content of the wood imposes tolerances on the dimensions of +0/-2mm. The tolerances are greater during mechanical drying where the shrinkage of the wood is greater +0/-4mm. Tolerances are checked on thickness, width and section lengths. For any request, please indicate our reference [PB6001000135-4-SL].